Oklahoma is headed back to the Women’s College World Series Championship Series. 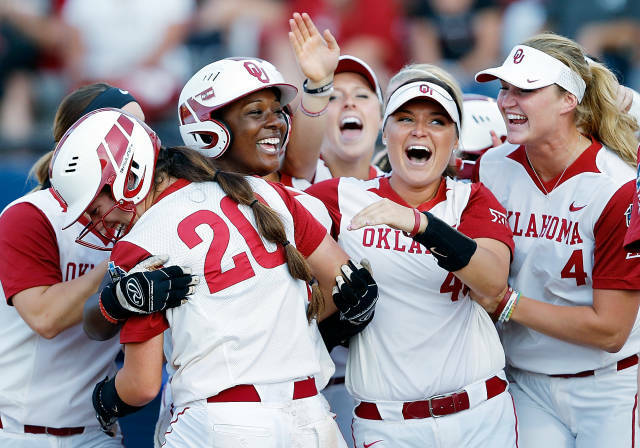 The third-ranked Oklahoma softball team (55-7) will play for its third national title after defeating 10th-seeded LSU (52-18) Sunday night, 7-3, in the semifinals of the Women’s College World Series. Oklahoma will play fourth-seeded Auburn (57-10) in the best-of-three Championship Series starting Monday night at 7 p.m. on ESPN. This is the fourth time Oklahoma is playing for a national title, including its third trip to the Championship Series since the format was introduced in 2005. OU won national championships in 2000 and 2013 and was the national runner-up in 2012. Sunday’s victory over LSU was the 30th in a row for Oklahoma, breaking the school record of 29 set in 2005. The last team nationally to win 30 straight games was Florida in 2008, winning 37 straight in all. Paige Parker earned the win for OU as she won for the 26th straight appearance, pushing her record to 36-3 on the year. Parker struck out four and allowed three runs on eight hits with two walks. Offensively for OU, Erin Miller, Shay Knighten and Kelsey Arnold each collected two hits, while the Sooners had 10 in total. Miller and Knighten also drove in two runs each. Like it has done in each game at the World Series, the Sooners scored first. With two outs, sophomore Nicole Pendley hit the second triple of her career, pulling a 2-1 pitch down the right field foul line. Senior Kady Self then drove her in when she chopped a single up the middle that Amber Serrett got a glove on but couldn’t corral. Oklahoma then took advantage of three LSU errors in the third inning to tack on two more runs. Arnold led off with an infield single, her first of the World Series, moved to second on a throwing error by third baseman Bianka Bell and took third on a groundout. Freshman Caleigh Clifton then hit a grounder to second base that was booted by Constance Quinn for another error, allowing Arnold to score. Clifton then stole second and reached third when the throw from catcher Kellsi Kloss went into center field. OU then capitalized on the error when Knighten singled through the right side, pushing the lead to 3-0. LSU fought back and tied the game in the bottom of the frame. Emily Griggs led off with a single, while Sandra Simmons was hit by a pitch to put two on. A sac bunt moved them into scoring position, while Self caught a fly ball in left field for the second out. It looked like OU might get out of the jam as Parker got ahead of Sahvanna Jaquish 0-2, but on the eighth pitch of the at-bat Jaquish drilled a game-tying homer to left center, her 13th of the season. The tie would not last long though as the Sooners had an answer in the top of the fourth. Self led off with a walk and reached second when sophomore Lea Wodach put down a bunt single. Freshman Raegan Rogers came on to run for Wodach, and she and Self were moved into scoring position thanks to a sacrifice bunt from Arnold. Miller came through with the clutch hit when she punched a full-count pitch up the middle to drive in a pair of runs. Later in the inning with runners on the corners, relief pitcher Carley Hoover threw a wild pitch. Kloss was unable to locate it and Miller hustled home to put OU in front 6-3. The Sooners also added another insurance run in the top of the sixth when Knighten pulled a 2-2 pitch into the bleachers in left field for her 13th homer of the season and second of the World Series. After giving up six hits during the first four innings, Parker settled down and retired seven in a row from the fourth through sixth innings. She ran into potential trouble in the bottom of the seventh when Simmons and Bailey Landry each singled with one out. The tying run was on deck but Clifton fielded a grounder from Bell, stepped on second and fired to first for the game-ending double play.